I go to Kakiat fairly frequently, and especially walk around the bottom part on a regular basis. I don't include these on my blog posts, but I did include this because it was particularly scenic with the final snow of the season. 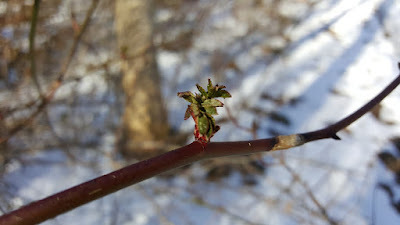 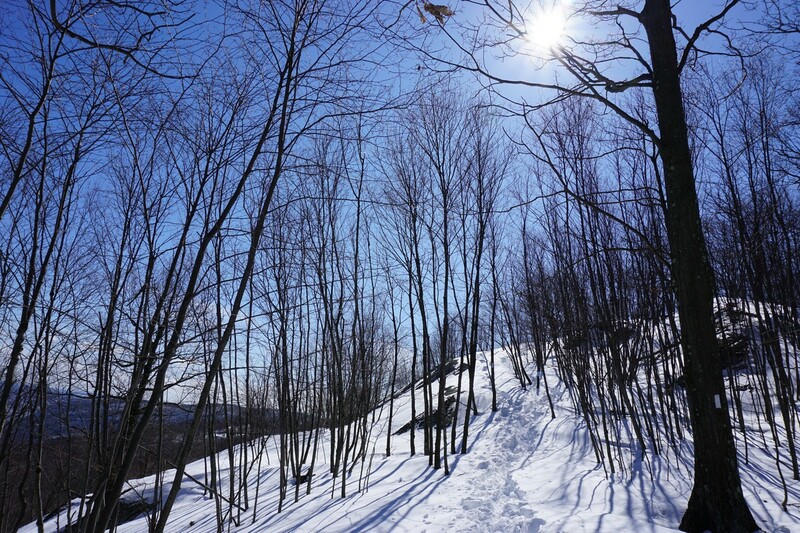 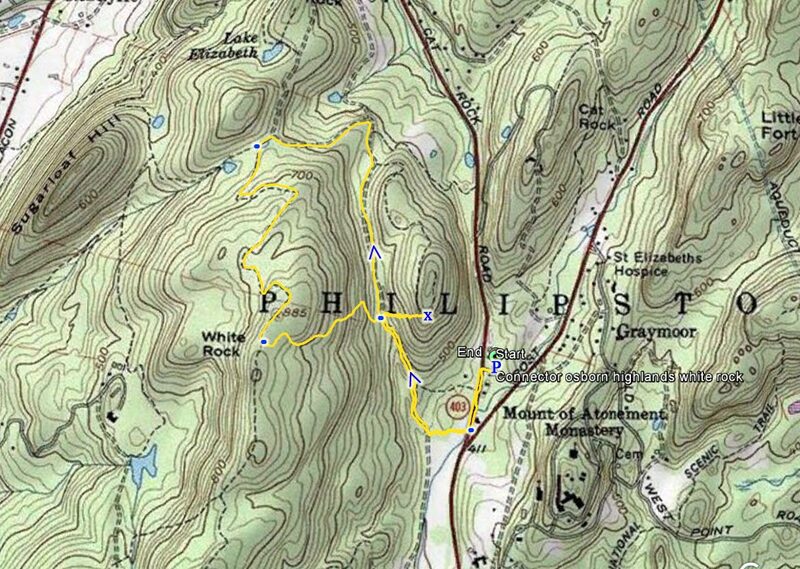 This short hike took place only several hours prior to the official start of spring. 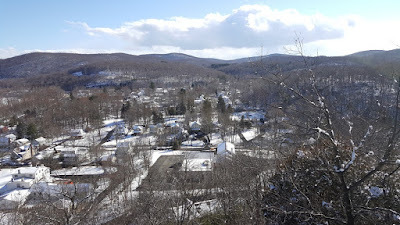 There was plenty of snow remaining from the previous week's large snowstorm, and this day was a beautiful, sunny, and warm day in the 50's. I took the opportunity to go on this short hike after work. 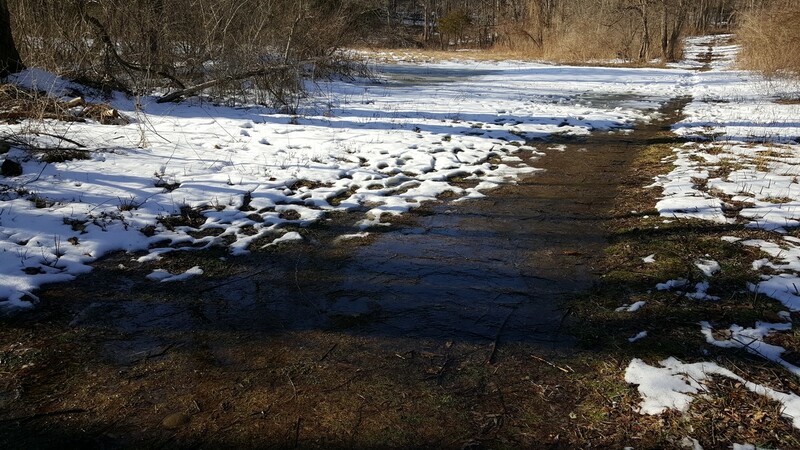 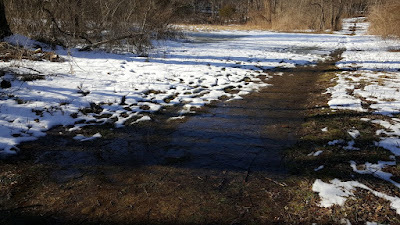 The snow was melting fast. 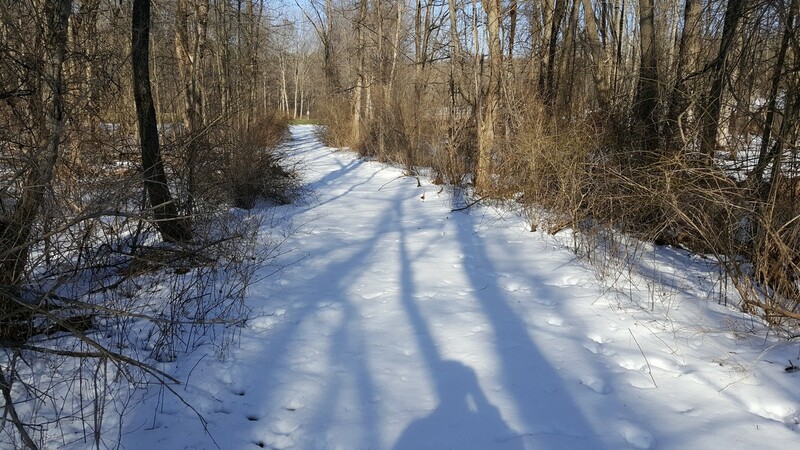 I know this would likely be my last walk in the snow until the winter season comes around again at the end of the year. 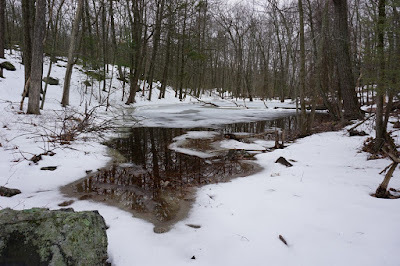 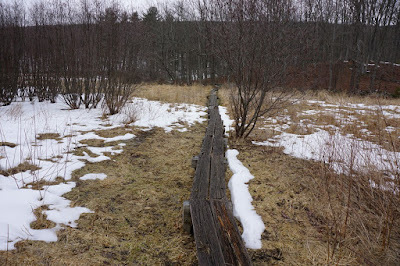 It was extremely wet and muddy, with some trails completely covered with flowing water from the melting snow. 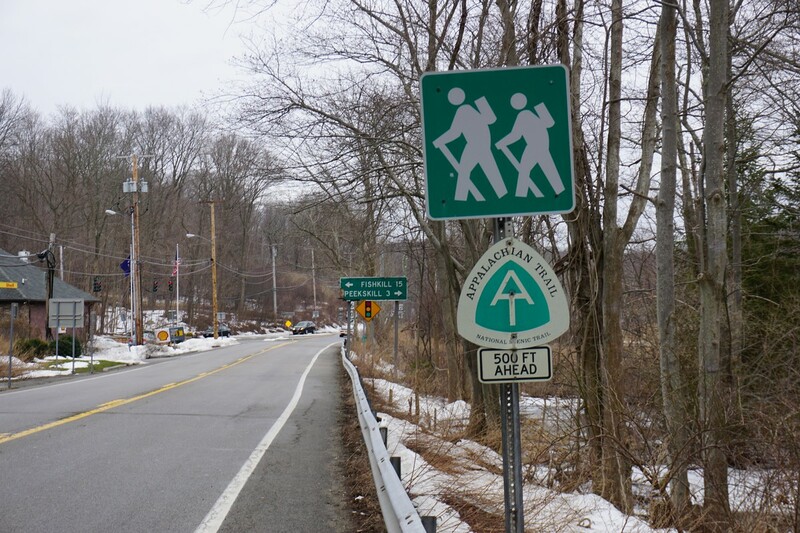 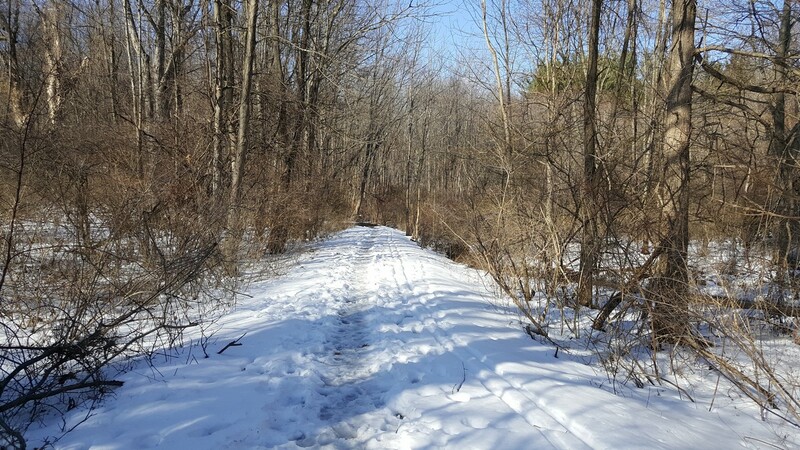 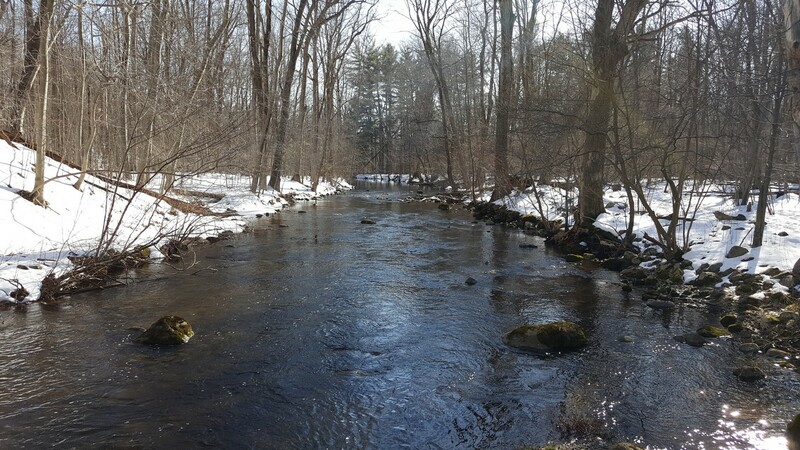 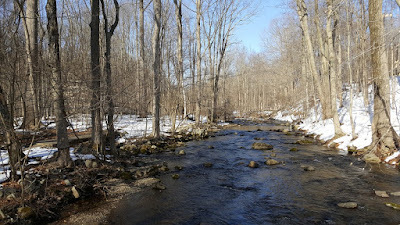 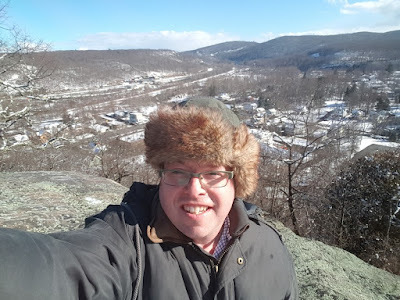 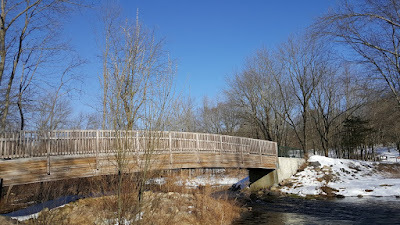 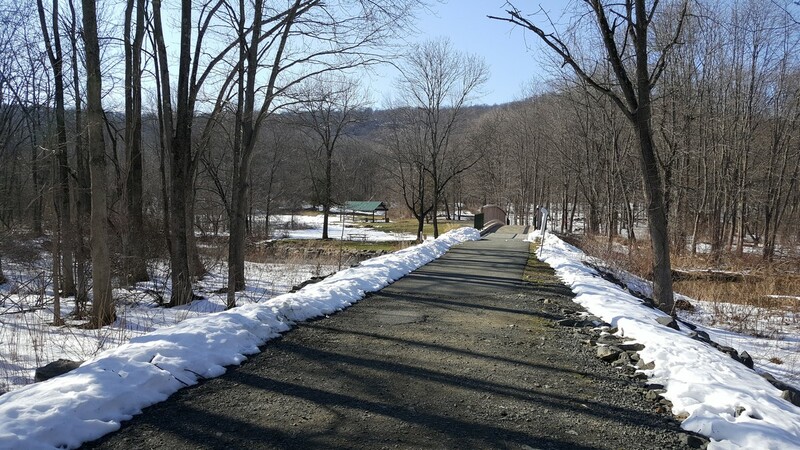 I parked in the Kakiat parking lot, cross the Mahwah River bridge, and took the Old Mill Trail around the loop to the Kakiat Trail. 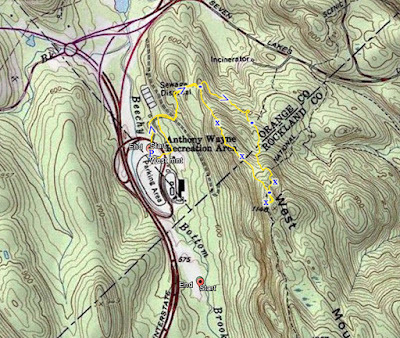 Where the Kakiat Trail hits the Mountain Trail, I took the Mountain trail the hill to the bend, and right before the steep ascent took a spur trail on the southern edge of Kakiat, to a bird meadow, and then back around parallel to the river towards the bridge and parking lot. 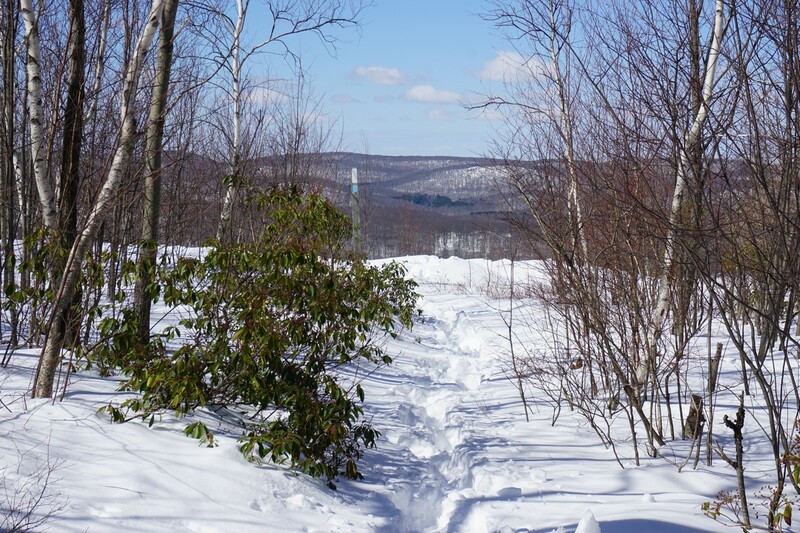 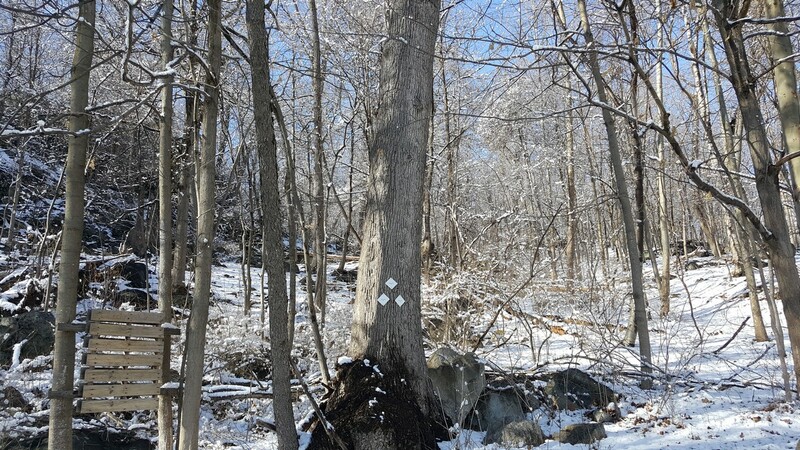 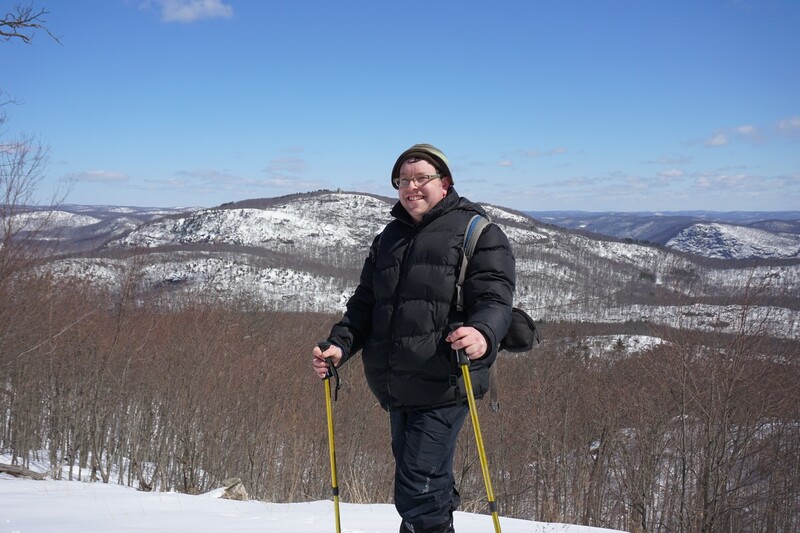 This was my first hike after the blizzard which dumped over 18 inches in the area. 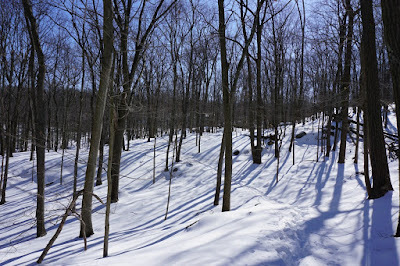 This was a beautiful, sunny, and cold day for mid-March. 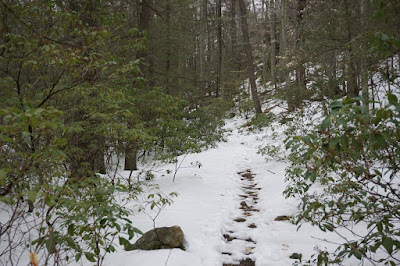 I had figured this hike would be well-traversed and would be easy to do, but I was proven wrong. 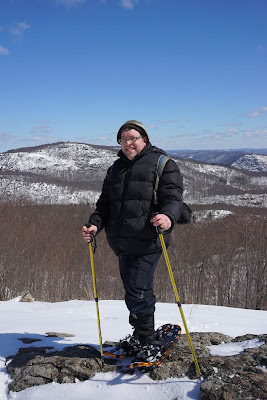 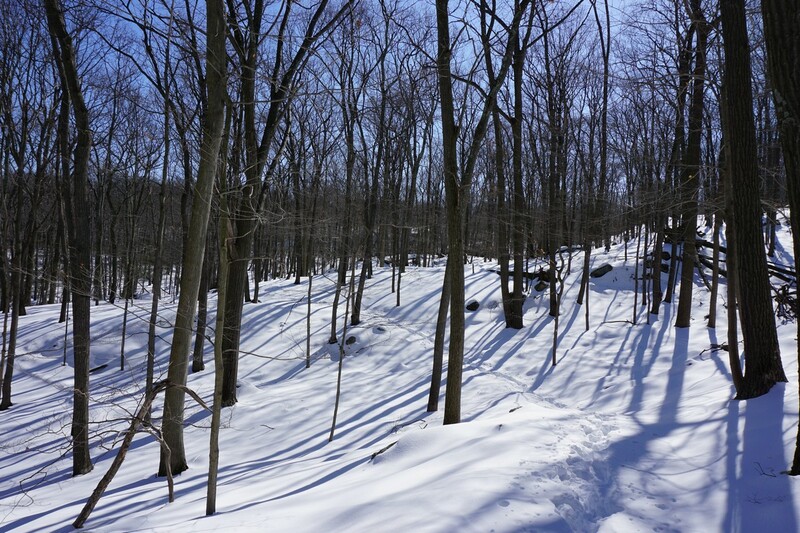 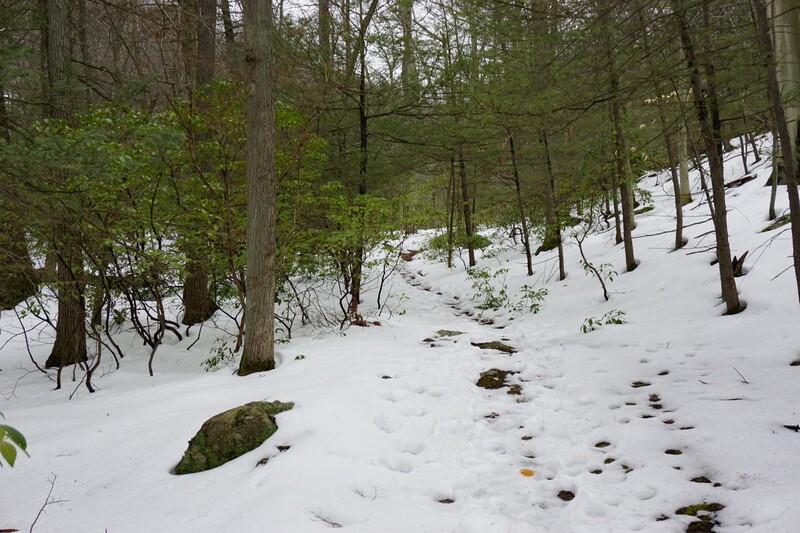 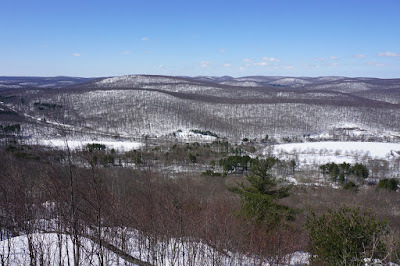 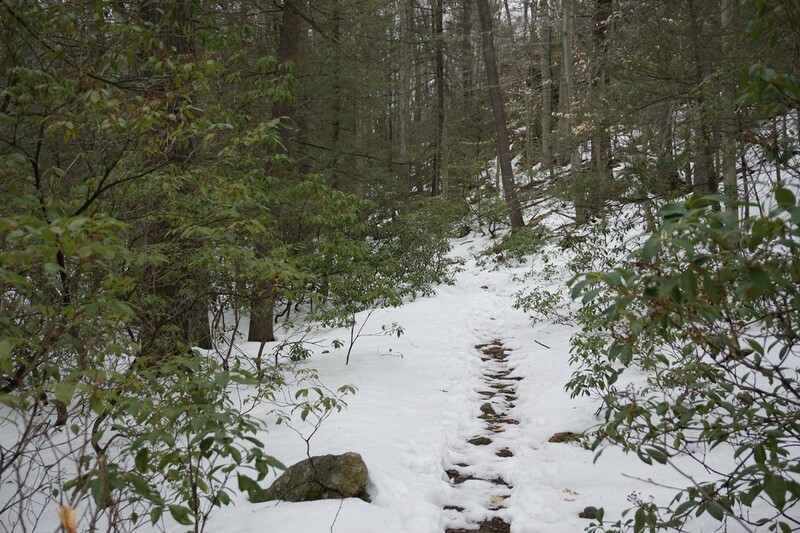 In fact, despite having snowshoes, this was my most difficult hike in years. 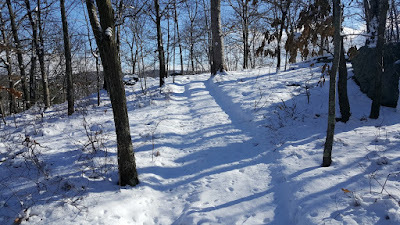 Although its a relatively short hike, I was waddling through 1 to 1.5 feet of snow, often the first to make the tracks. 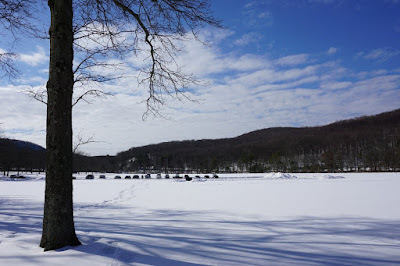 I parked at the Anthony Wayne parking lot, which was plowed in one small section. 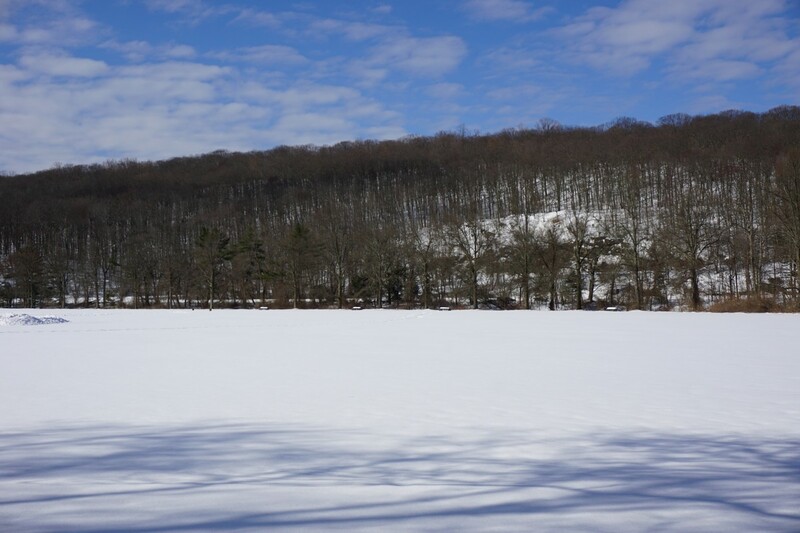 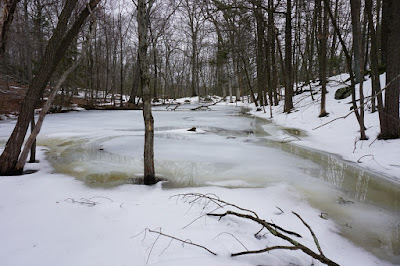 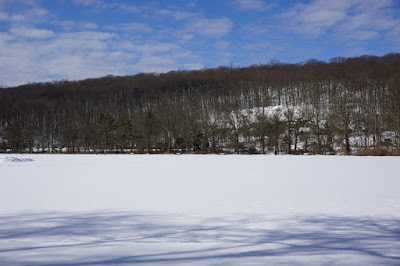 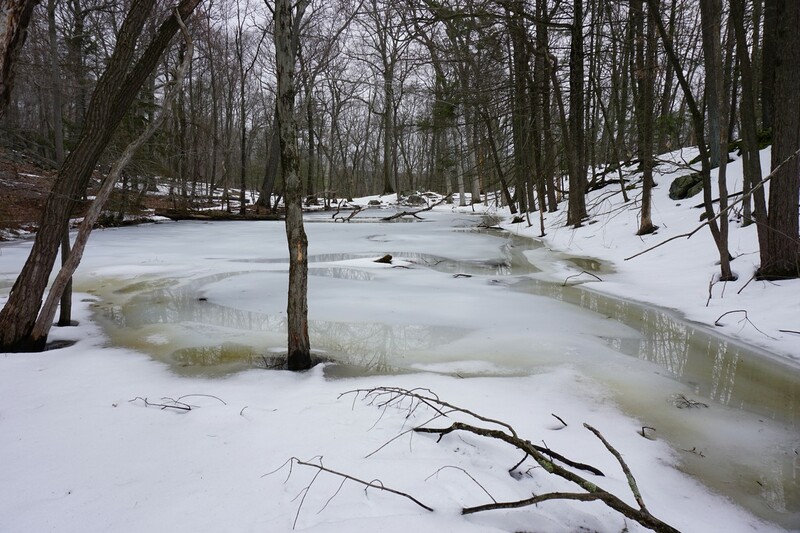 The rest of the lot was covered with snow and looked like a wintery lake, as indicated in the photo below. 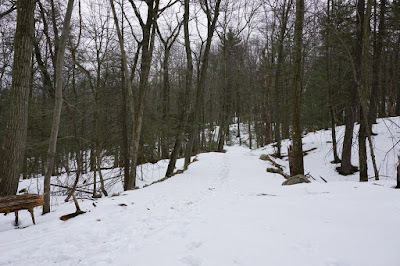 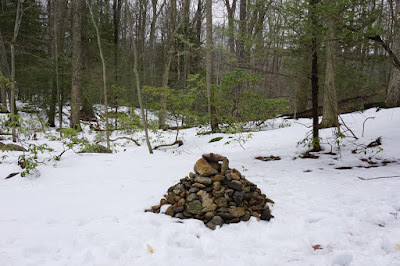 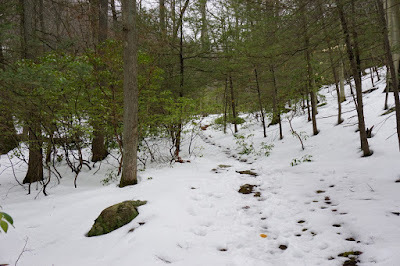 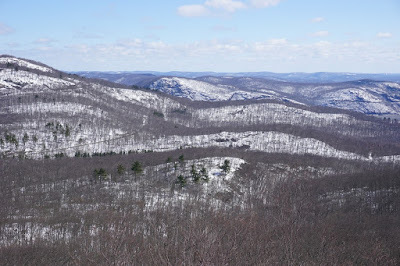 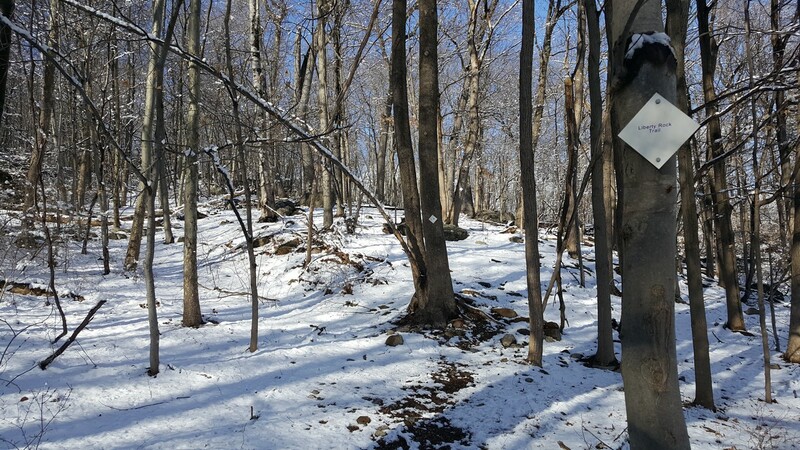 I took the Fawn Trail up, passed the Timp-Torne Trail, and continued to the end of the Fawn Trail at the Appalachian Trail (AT). 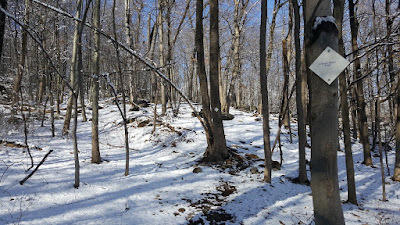 The AT climbs rather steeply at this point, and I climbed up the first viewpoint, facing north and east, and then continued past the intersection with the Timp-Torne Trail to the view facing west at Anthony Wayne. I had intended to go further, but without any trailblazers before me and the difficult conditons, I opted out and started heading down. 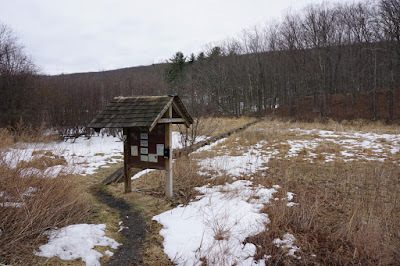 I took the Timp-Torne Trail down the north end of the mountain, back to the Fawn Trail, and then near Beechy Bottom Road took another old path parallel to the road and then across a path back to the parking lot. 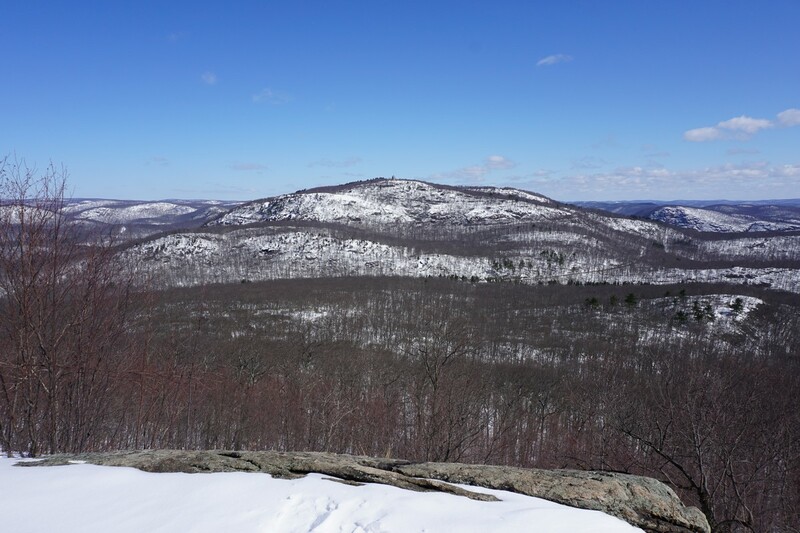 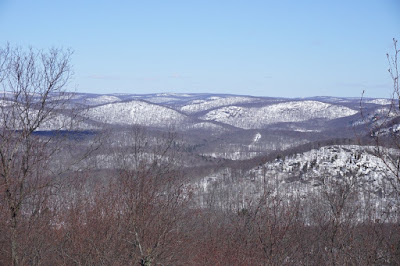 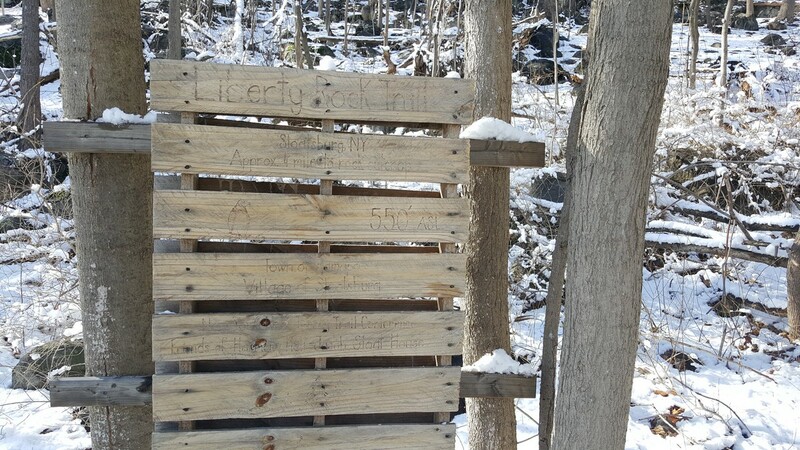 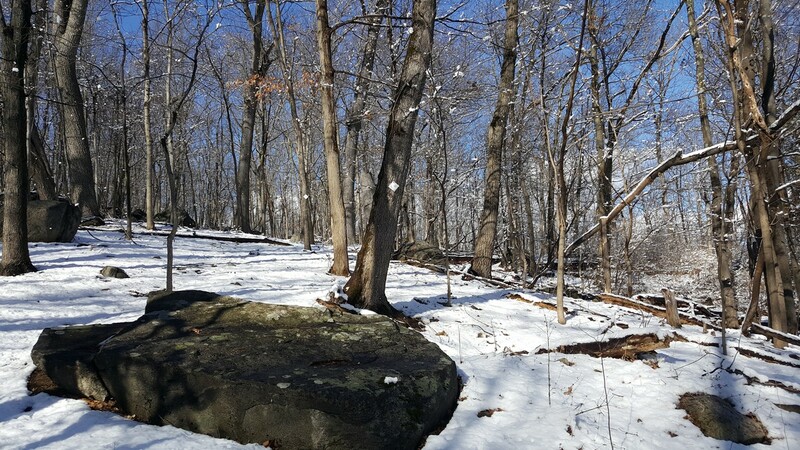 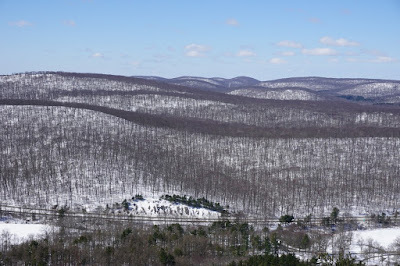 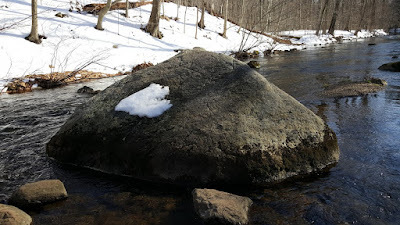 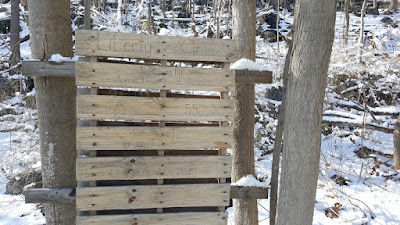 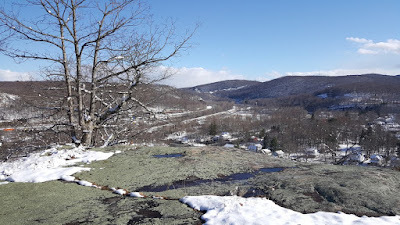 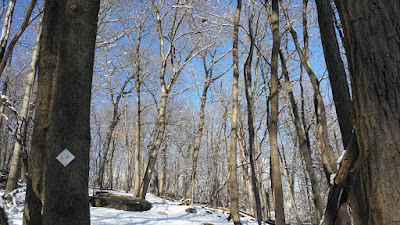 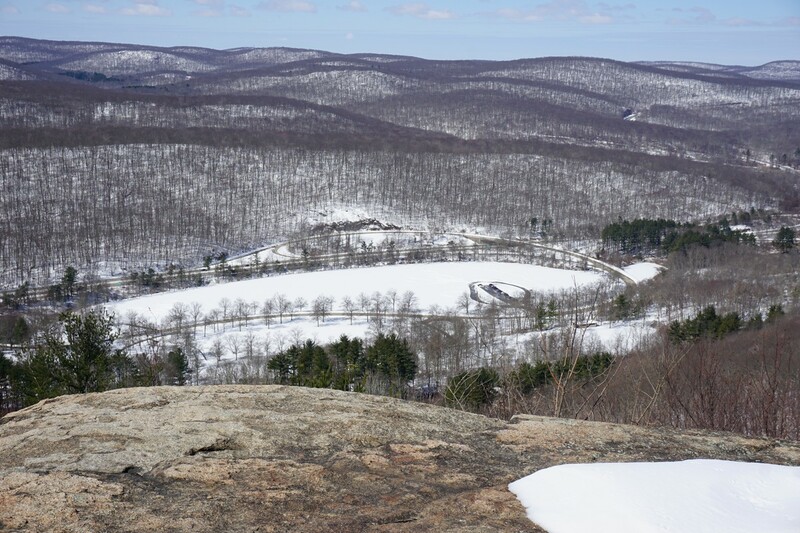 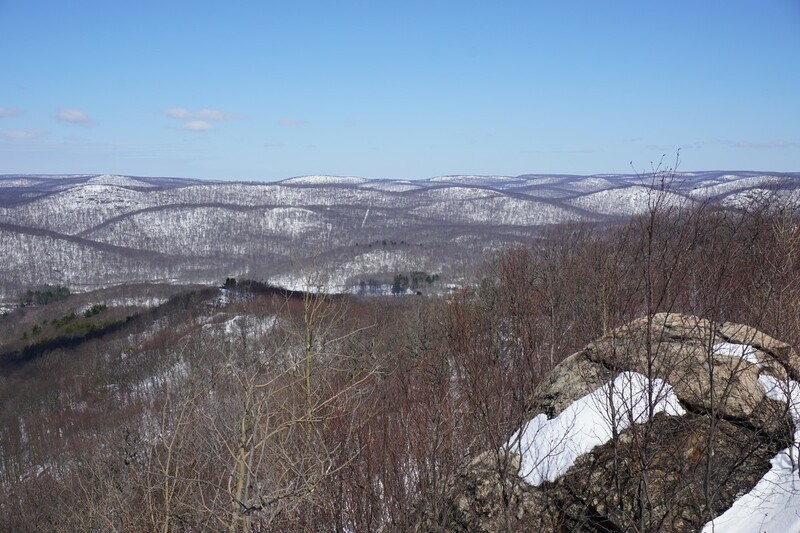 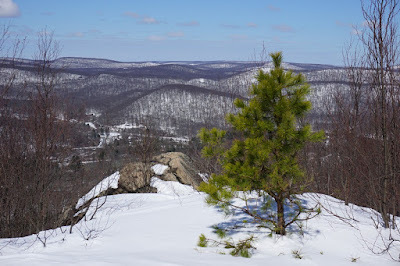 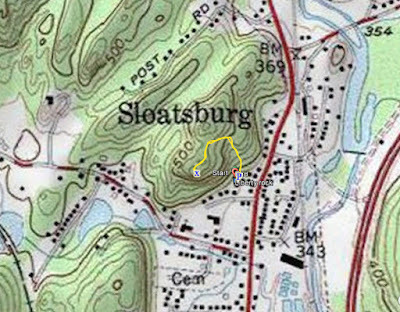 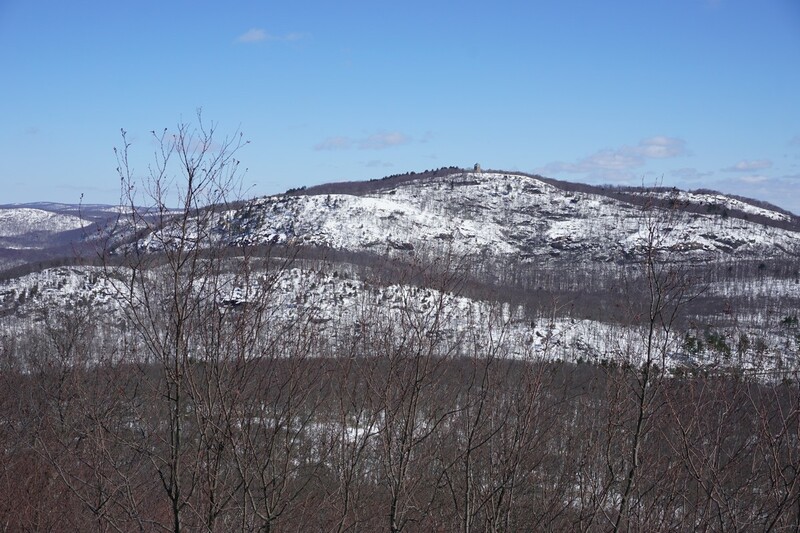 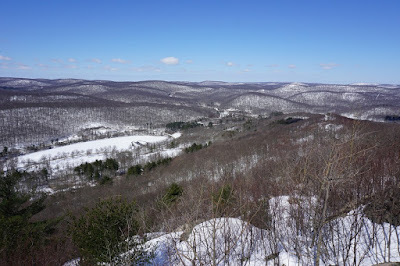 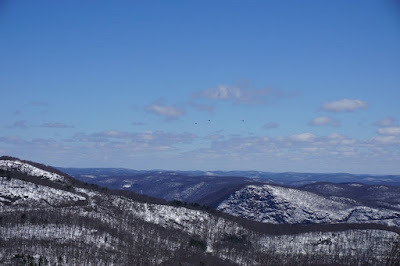 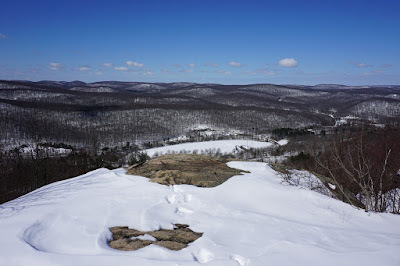 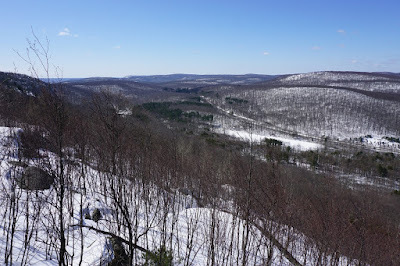 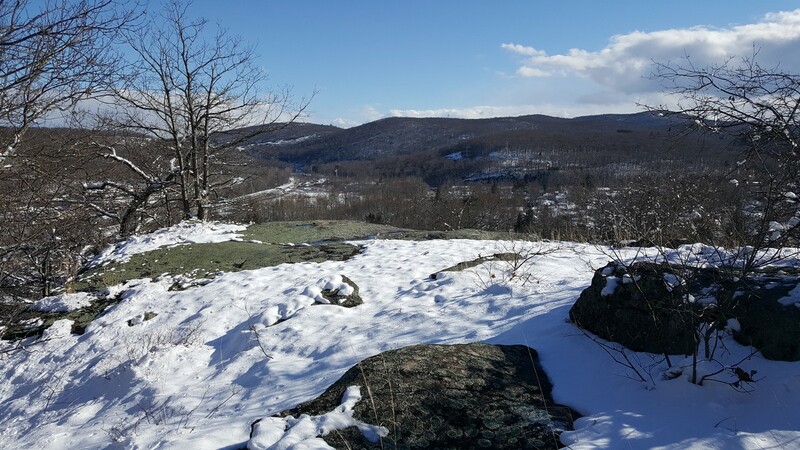 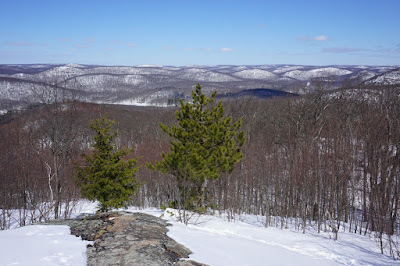 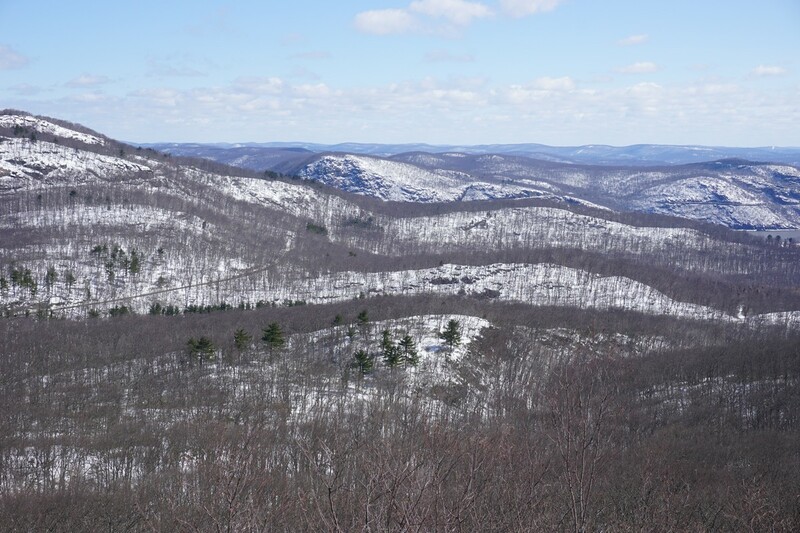 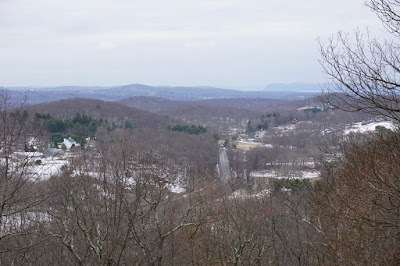 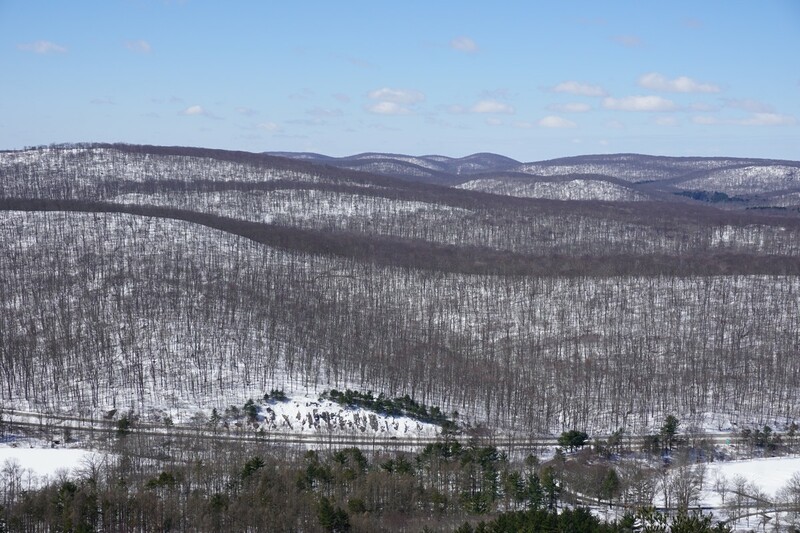 Liberty Rock is a small mountain jutting right outside of Sloatsburg. 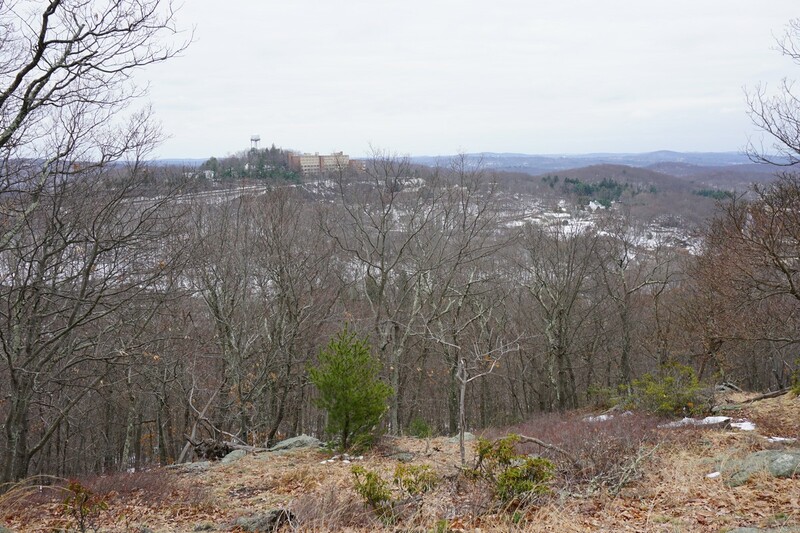 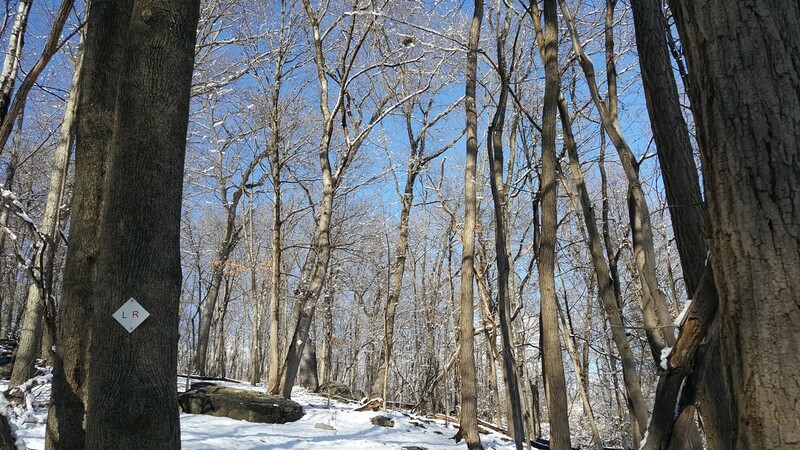 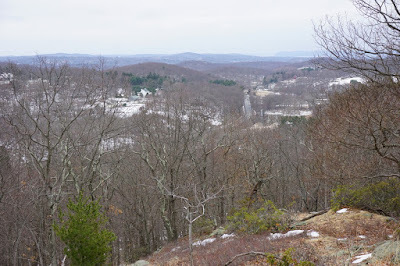 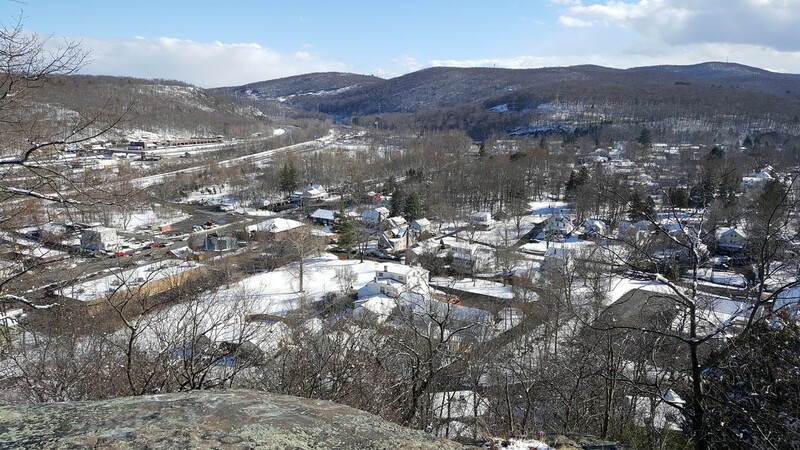 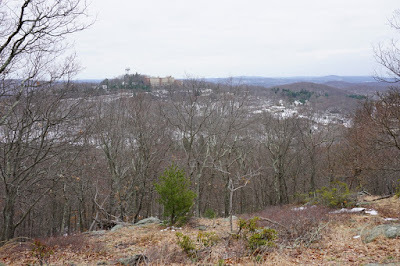 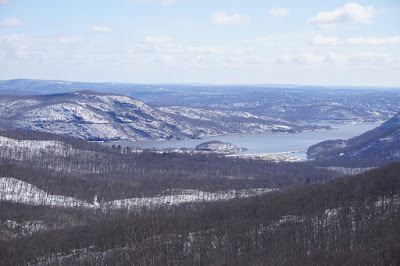 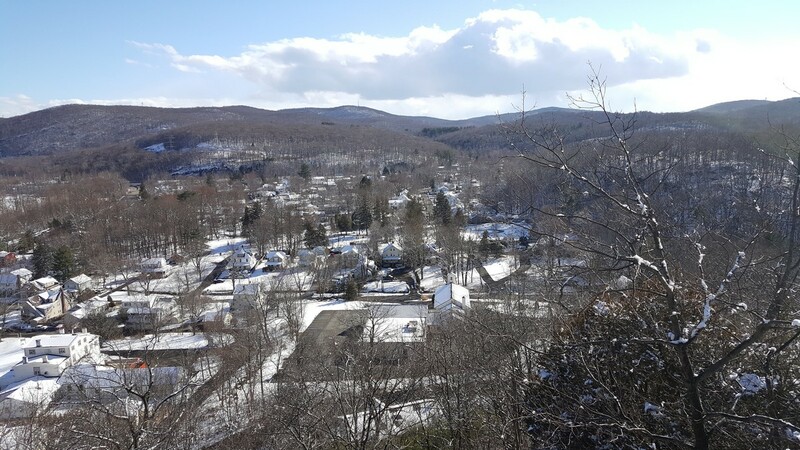 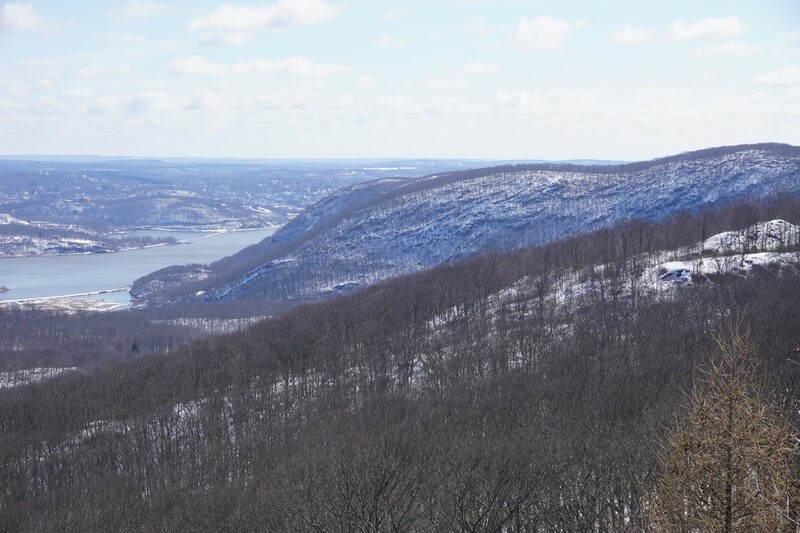 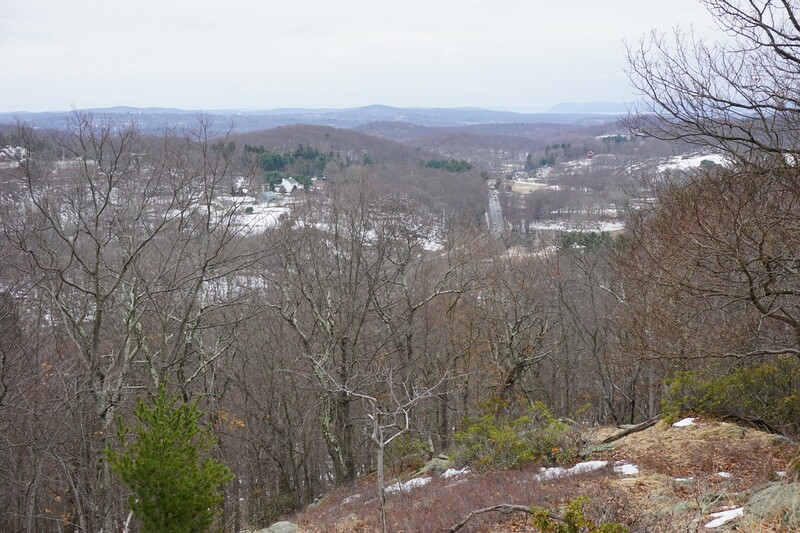 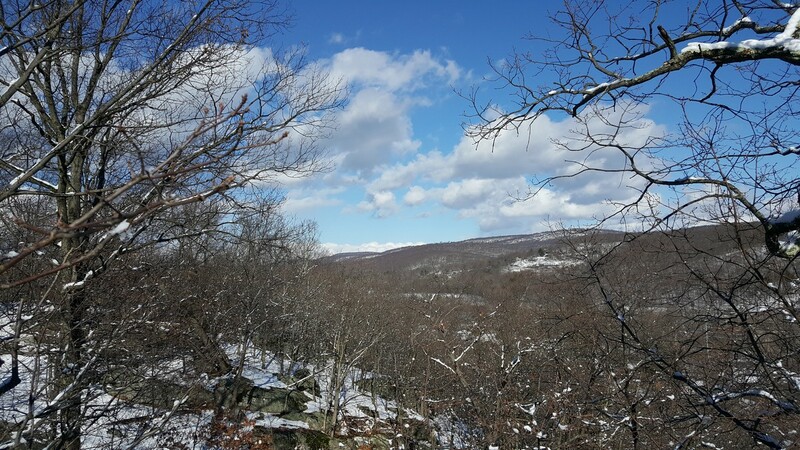 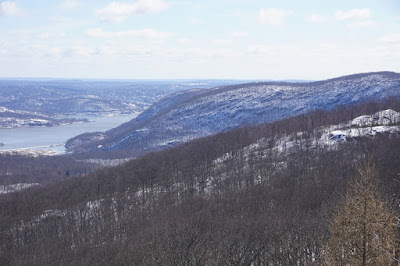 The top is a rocky promenade with a view of Sloatsburg and the surrounding area. 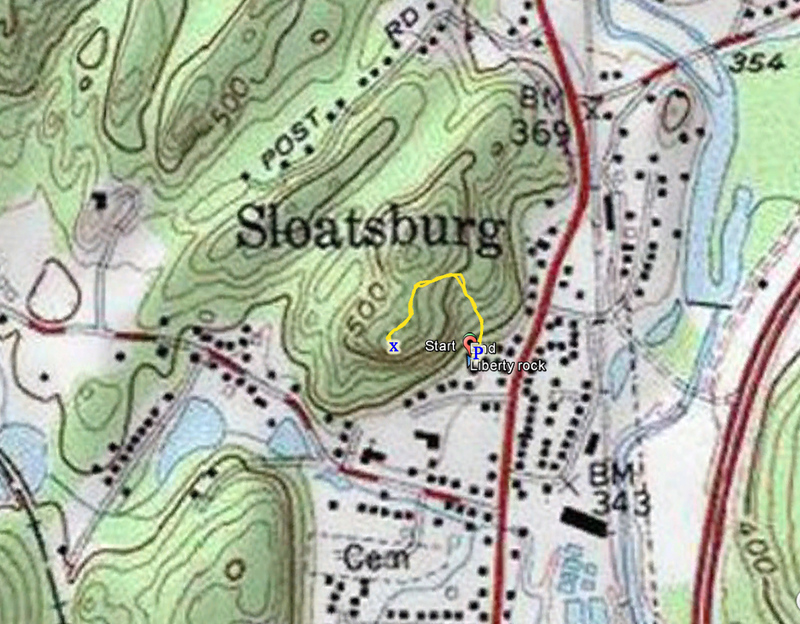 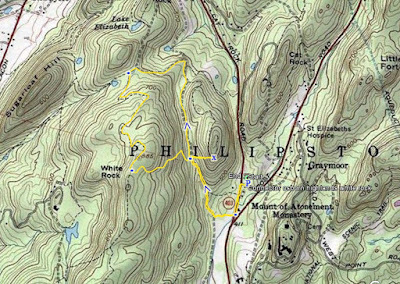 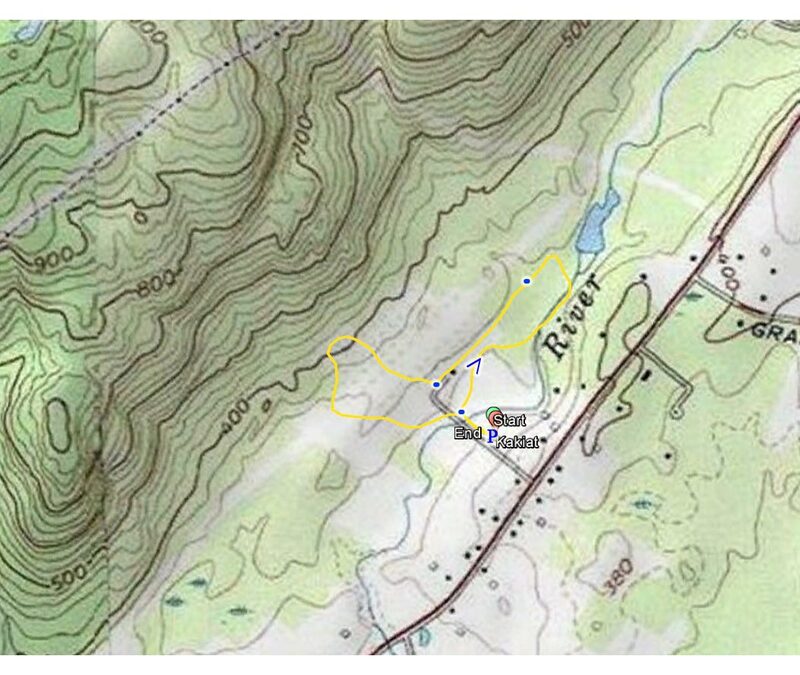 I only recently found about this from the new Harriman maps which showed this trail on it. 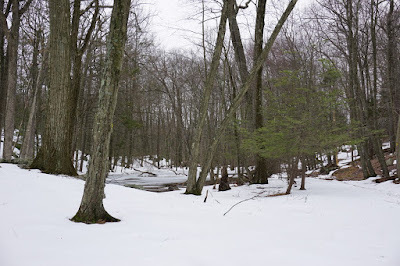 It had snowed several inches in the morning, but the roads were fine. 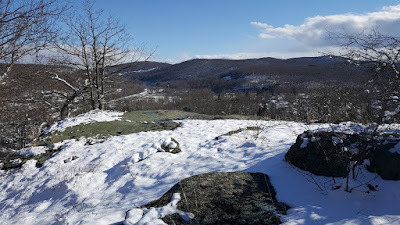 On my way home from work I decided to do this short hike. I parked in the new parking lot right off Route 17, and took the trail up. 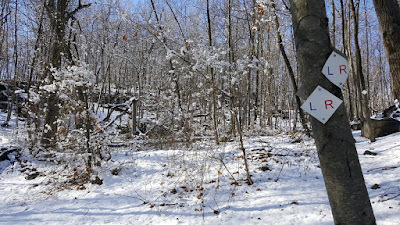 I noticed from the blazes that the trail markings and sign-post up front are relatively new. 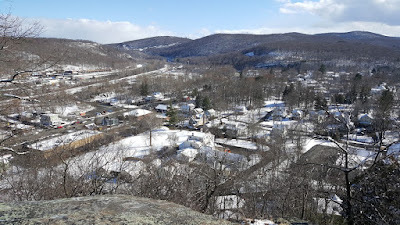 I climbed up pretty quickly, took some nice pictures at the view with my cell phone camera, and then headed back down the same route.